Cathy Stokes is a retired deputy director in public health and a community volunteer. She is a member of The Church of Jesus Christ of Latter-day Saints. Stokes was born in Mississippi, the daughter of sharecroppers. As a toddler, she moved north with a great-aunt and her husband. Although raised in stark poverty, she had opportunities in Illinois to improve her life. She obtained her BS in nursing at DePaul University and then worked her way up through Chicago’s public health system. At the time of her retirement, she was deputy director for the Illinois Department of Health. 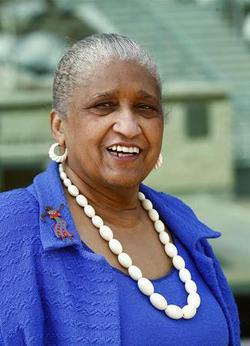 She served as vice chairman of the board of trustees of the Chicago InnerCity Youth Charitable Foundation for 16 years. She moved to Utah in 2006 after her retirement. On a flight to Honolulu for a nursing convention, Stokes was introduction to the LDS church when the pilot recommended that his passengers visit the newly renovated LDS temple. The temple was closed, however, but she asked the visitor center’s missionaries many questions and then filled out a form requesting more information. A few weeks later, missionaries appeared at her door in Chicago, and after investigating the Church for several months, she was baptized. In Chicago, Stokes served as Relief Society president, Young Women president, on the Church’s regional public affairs council, and as a member of the advisory board of the Illinois Chicago Agency of LDS Social Services. She has also filled assignments for the Church Public Affairs in Africa, Australia, and New Zealand. In Salt Lake City, Stokes was a member of the Utah AIDS Foundation board of trustees. She was named as a member of the new Editorial Advisory Board for the Deseret News. She is also membership chair of the Utah chapter of the African-American Genealogy and Historical Society. She greets and directs patients at the Huntsman Center Hospital two days a week. She was featured in the book, Mormon Women: Portraits & Conversations, and in “Lives of Service,” an LDS Church documentary about service. She also participated in the 1996 LDS missionary fireside with Elder M. Russell Ballard, one of the Twelve Apostles of the Church of Jesus Christ. This page was last edited on 24 January 2014, at 15:53.